Here's a special song from Sounds of Isha on Sadhguru's birthday, September 3. It is aptly named, "Thank You". How does one express their gratitude to the air that sustains our life? How do you thank the food that builds you? Whom do you thank for the vision bestowed upon you? Whom to thank for the breath that sustains you? And still, how can one not thank? When the basis of your life is not all your conscious doing, how can one not feel grateful? When you grow out of your ignorance to discover yourself, how can one not thank that being who helped you with this? Not that it matters to Him. But it matters to us that we thank Him - our Guru - the light of our path, the meaning to our lives. In the endless pit of what once was me. the pain it is, but the joy it brings. for showing me what I could be. you could show me all the things I would be willing enough to see. the pain I have known, the pain I have known. you saved me yes you saved me. Thank you I thank you. if not years to see. of places to go, of people to which to turn. you came and you caught me..
over the hanging cliffs of misery. I thank you even for the things I'm not aware of. there would be no peeling only shedding of my skin. 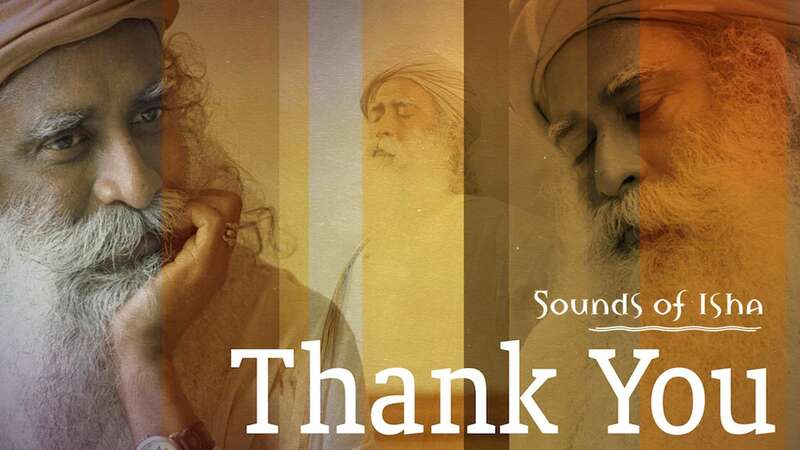 Thank you seems so insignificant to express the amount of gratitude I have for Sadhguru; it is beyond words. Happy Birthday Sadhguru. A enlightenment music. Thank you. Thank you, thank you to isha sounds for great "thank you" .